Our client is a luxury leisure resort company with several resorts spanning multiple countries, each with its own website. Their measurement was set up on an individual basis for each of their 46 sites, with multiple containers on different sites. 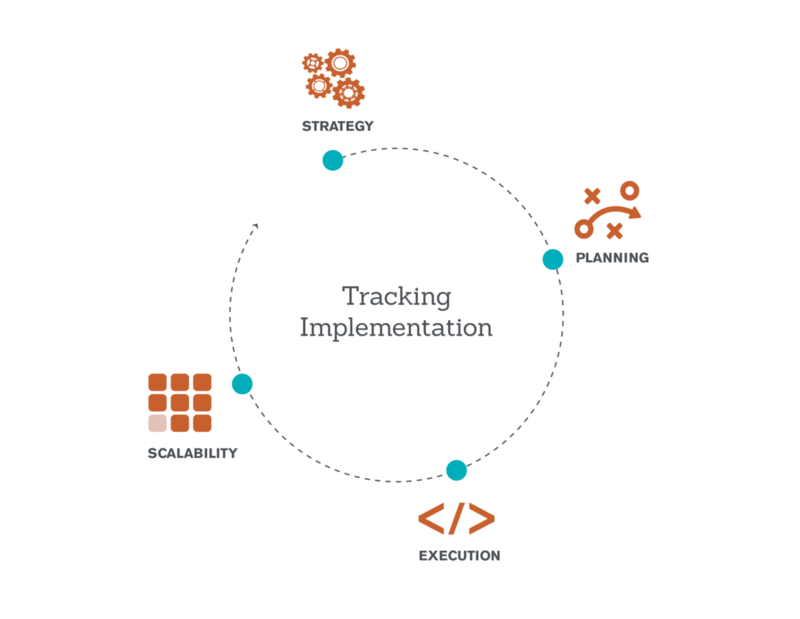 It was a standard approach to tracking, but it wasn’t scalable. It’s like having a different TV for each channel, versus having all the channels in one TV (you get all the channels either way, but it’s a lot harder to watch, make use, or optimize them on separate TVs). The Seer Analytics team was brought on board to create a scalable tracking implementation—from strategy and planning all the way to execution, where our core tracking could be used across all 46 websites. Click here for a quick project summary. Click here to geek out on all the details. Our client already had Google Analytics 360 and Google Tag Manager (GTM) 360, but they weren’t using any of GTM 360’s key features. 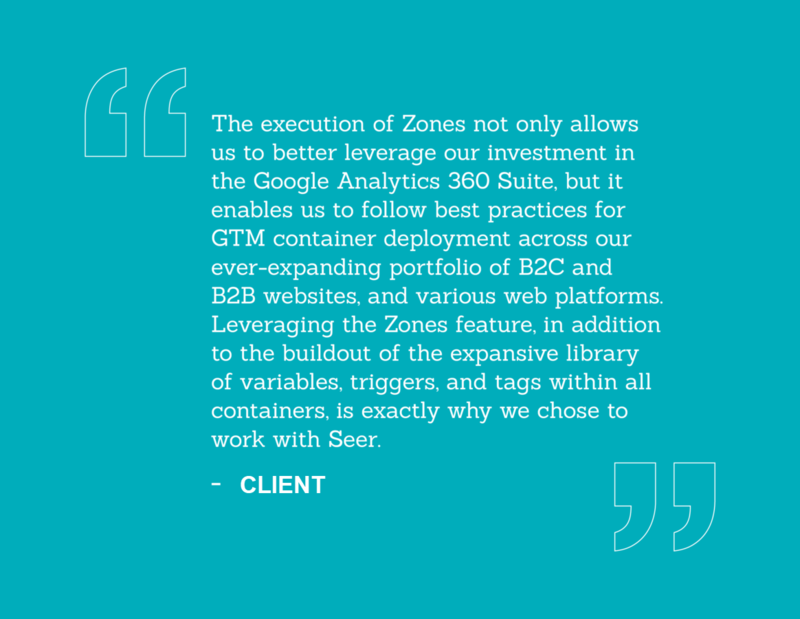 Our strategy was to use a tool they already had (GTM 360), and leverage one of its most powerful features, Zones, to house any and all tracking under one container. By using Zones, we were able to set goals to help them tag their expanding portfolio of sites in a way that was scalable and met best practices. Tag all of the 46 sites without needing to create and implement unique code snippets on each site. Implement tracking in a scalable way so that when new brands and sites are launched, our core tracking carries over. Make things as simple as possible for the client’s developers, so that they’re not having to add 46 containers on 46 sites. Consolidate pre-existing conversion and ad performance tracking. Our first step was to determine what a scalable and efficient container structure would look like. GTM 360’s Zones were the perfect solution for such a structure. A zone allows you to load a container within a container—and fire tracking in that loaded container. 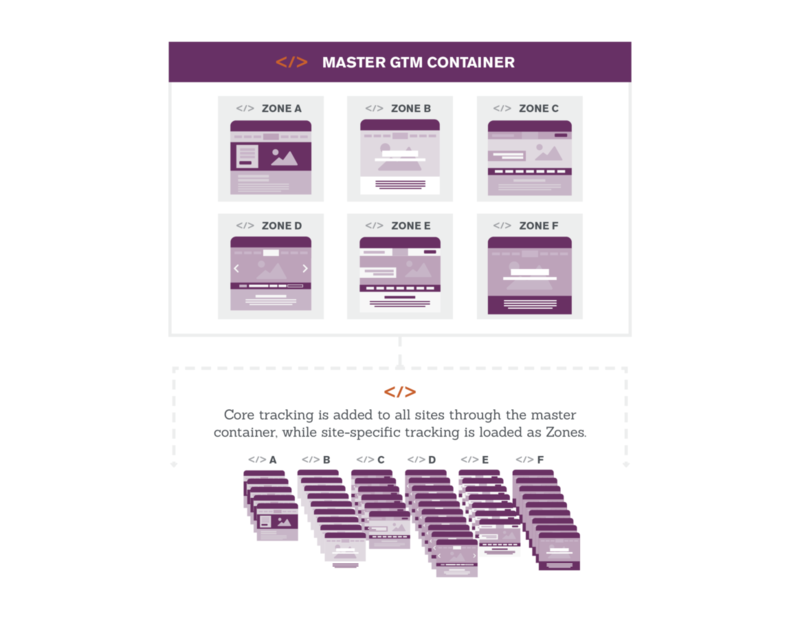 Core tracking for all sites would live in a master container, while specific containers would load as Zones on their appropriate website only. 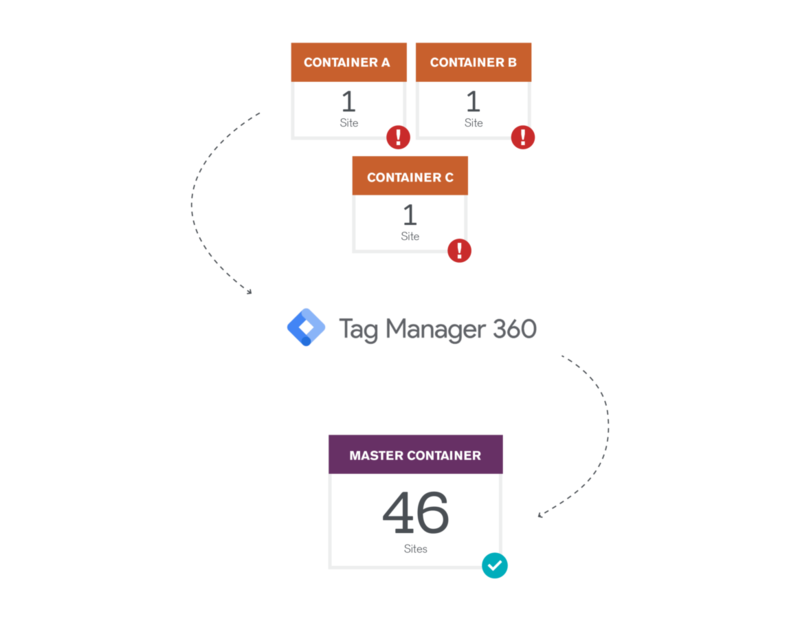 Without Zones, any site-specific or pre-existing conversion tracking would have had to be added by 1) adding site-specific GTM containers on their respective sites, or 2) manually exporting and importing the tags, which is not scalable. Create a single GTM container to be added to all of the sites. Create site-specific containers that can be loaded onto the master container using Zones. Load agency-specific containers using Zones and fire where appropriate. Tag the sites based on the site template so that the tracking will carry over across multiple sites, as long as they are built with the same template. Build a comprehensive setup in GTM so that data is sent to the correct Google Analytics property (or other platform, like Ads or Facebook). Zones allowed our team to apply tracking efficiently and consistently across all 46 sites. Instead of the dev team wasting time adding multiple GTM containers across each individual site, we ended up having ONE GTM CONTAINER live across all of their websites. The end product was a flexible implementation, allowing us to be streamlined AND scale the work at the same time to better accommodate our client’s growing portfolio. Cutting down on the site-specific work led to a cost savings of at least $36,000, as well as development time upfront. Implementation across all the sites would have taken significantly longer and would have been harder to maintain. Without using a scalable tracking strategy, each net-new site would have to be tagged from scratch, adding additional development work. While it can be purchased separately, one of the key benefits of purchasing Google Analytics 360 is that it is bundled with Google Tag Manager 360. 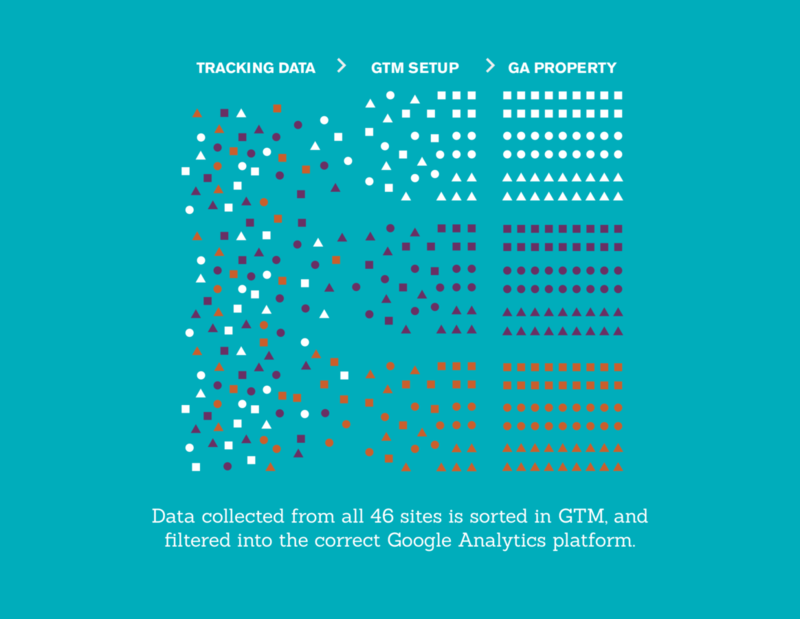 While this is often overlooked, the features of GTM 360 bring just as much value to our clients as anything within Google Analytics 360. Our client was paying for one of the most sophisticated Analytics platforms in the game (GA 360 and GTM 360) for their sites. Unfortunately, they weren’t leveraging GTM 360’s Zones feature to use the platform to its full potential. Using Zones, we made implementing measurement across their 46 sites consistent, scalable and efficient. This saved them an estimated $36,000 annually in resources for implementation and maintenance.